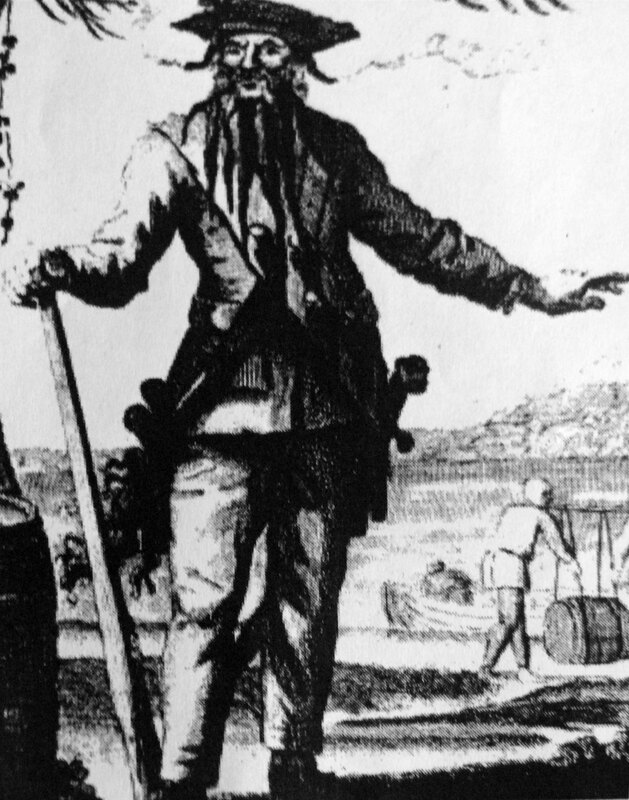 Probably, the most dangerous pirate that lived during colonial time was Edward Teach who was also known as Blackbeard. Very little is known about his youth except that he was born in Bristol, England around 1680. Teach was tall and lean with a long black beard and long black hair. Historians tell us that at some point Teach became a professional soldier, fighting from 1702 to 1713 in Queen Anne's War. Then, when the war drew to a conclusion Blackbeard became a pirate. In 1716, he joined the crew of legendary pirate Benjamin Homigold. It wasn't long afterward that Homigold gave Blackbeard his own ship. The 2 ships put fear in every merchant captain who sailed from South America to New England. Then, just as their enterprise was thriving, Homigold decided that he no longer wanted to be a pirate. Soon after, he asked for a king's pardon, and was given one in 1717. Stede Bonnet was from a wealthy family in Barbados. Stede decided that he wanted to be a pirate so he had a boat constructed that he named Revenge. However, in his first battle engagement his boat was almost destroyed, and even worse his men learned that he knew nothing about sailing a boat or being a pirate. The crippled Revenge managed to make it into Nassau harbor in August of 1717. Coincidentally, Blackbeard and his boat were docked in the same harbor. When, Bonnet's men heard that it was Blackbeard's boat, they immediately went to talk to him. They hoped that he would take control of the Revenge, which he did. On November 17, 1717, Blackbeard and his men captured a large slave ship named the La Concorde. He remodeled the boat with 40 guns, and renamed it Queen Anne's Revenge. Blackbeard now had 150 men, and 3 ships, and he was feared on both sides of the Atlantic Ocean. He treated each capture ship differently. If the crew of a ship gave up without any problems he would usually let the crew go. However, after the city of Boston started hanging pirates, Blackbeard began treating ships from this area more harshly. He was very shrewd and intelligent. The following spring Blackbeard and his men pulled into the harbor in Charleston, North Carolina. They demanded a chest full of medical supplies, and when they got them they left. Then as they continued north up the coast they were hit by a huge storm and his ship was destroyed. Blackbeard escaped on one of his smaller ships, and he soon set up a base of operations on the Pamlico River on the northern coast of North Carolina. From there he began attacking ships at sea and on the river. In North Carolina he found an ally in Governor Charles Eden. Blackbeard gave Eden money in return for allowing the pirating to continue. Before long, everyone was irate, including the merchants, plantation owners, and shippers. After realizing that complaining to Governor Eden was useless they turned to Virginia Lieutenant Governor Alexander Spottswood for help. He assigned 2 British ships, under the command of Lieutenant Robert Maynard to North Carolina to confront Blackbeard. Lieutenant Maynard finally caught up with Blackbeard on November 22, 1718, in an inlet of Ocracoke Island. The battle would go on until Maynard shot and killed Blackbeard. Maynard ordered Blackbeard's head tied to the bowsprit of his own ship. For centuries rumors have circulated about his buried treasure. Most believe that Blackbeard buried large amounts of gold and treasure on a beach somewhere along the Atlantic coast. However, after all these years no one has ever claimed to have found it.